Seven men have been sentenced for their part in a violent brawl before the Portsmouth against Aldershot FA Cup tie last November. 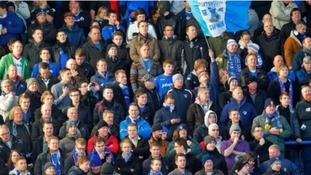 Two police officers were injured inside the John Jacques pub on Fratton Road in Portsmouth on the morning of the match. At Portsmouth Crown Court, the group of four Aldershot and three Portsmouth supporters received a total of 24 years in Football Banning Orders (FBO). Five of them were also sent to prison, received a suspended sentence, one awaits a further sentencing hearing. Adam Squibb, 23, of Well Street, Ryde. He was convicted of affray and received 30 weeks imprisonment. Portsmouth Football Club are to reveal the name of their new manager later today. The side is the biggest fan-owned team in the country after a consortium took over the club in April 2013. The previous manager Guy Whittingham was sacked last month. Portsmouth Football Club has released a statement saying it is shocked by allegations that ex-Portsmouth player Sam Sodje had taken money to fix matches. If these serious allegations are true then we are extremely shocked and saddened by them, as match-fixing of any type goes to the heart of the integrity of the game. The player in question no longer plays for the club and we have not been contacted by the authorities, but of course we would cooperate fully with any inquiry." Ex-Portsmouth footballer Sam Sodje was filmed by the Sun on Sunday saying he punched an opponent in a League One match in order to be sent off in exchange for £70,000. He was also recorded saying he arranged for another player to get £30,000 for getting a yellow card. Portsmouth Football Club has said it is "shocked and saddened" by the claims. It was claimed in court today that the Russian former owner of Portsmouth Football Club was the primary mover in a 500 million Euro fraud which forced the bank he controlled to be nationalised. Vladimir Antonov and his Lithuanian business partner are fighting extradition to Lithuania. The men claim they are victims of a politically motivated conspiracy. The hearing in London is expected to last two weeks. Fratton Park Credit: Chris Ison/PA Wire. Portsmouth Football Club has announced their support for plans to build a giant Tesco superstore near their football ground Fratton Park. The 5,500 square foot development would be built on land adjacent to Fratton Way. The public will be able to have their say on the plans at public consultation events on Friday 5th July and Saturday 6th July in the Victory Rooms. Read: Latest developments at Portsmouth Football Club. The end of the line for Pompey?